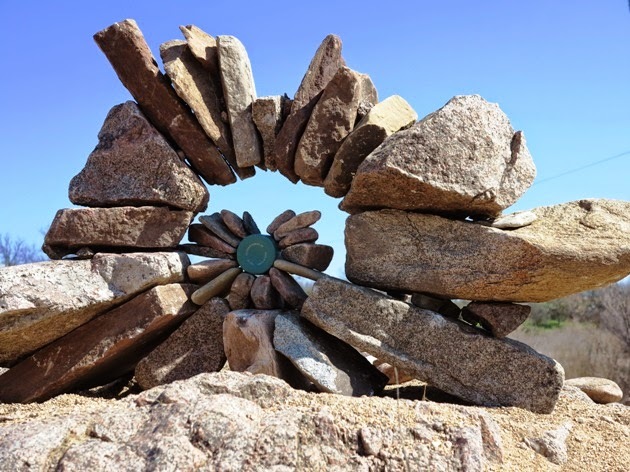 I wrote about the Llano Earth Art Fest that I attended in 2015. 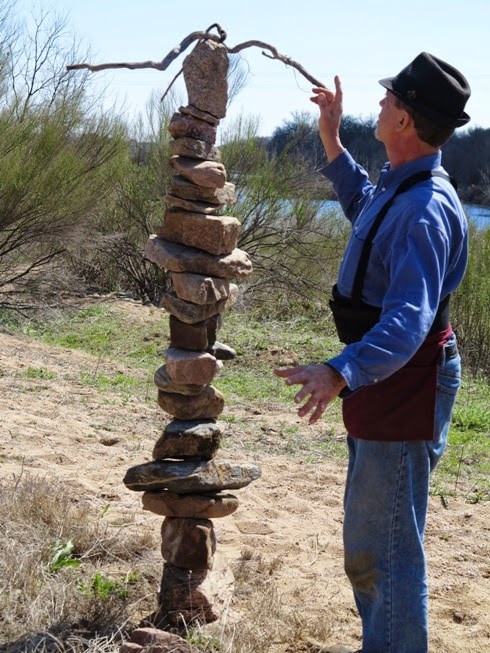 If rock stacking catches your interest--and it should--make plans to attend the Fest March 11-13, 2016. Lots of fun and surprises. A small notice in the newspaper about the Llano Earth Art Fest piqued my interest, so Larry and I drove to Llano to check it out. 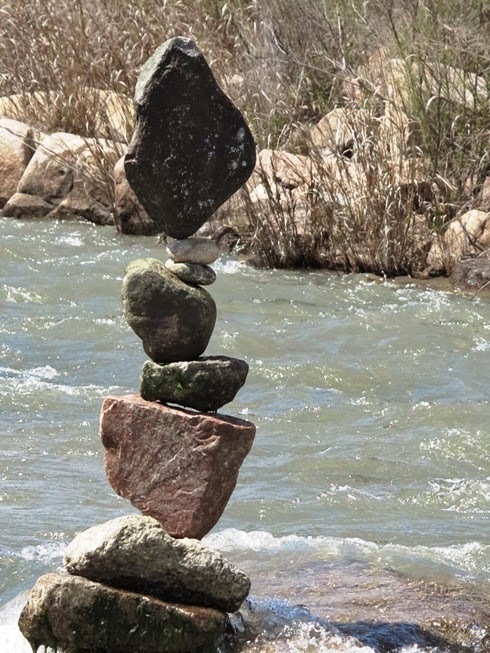 What also caught my interest was the National Rock Stacking Championship that would be held as part of the festival. 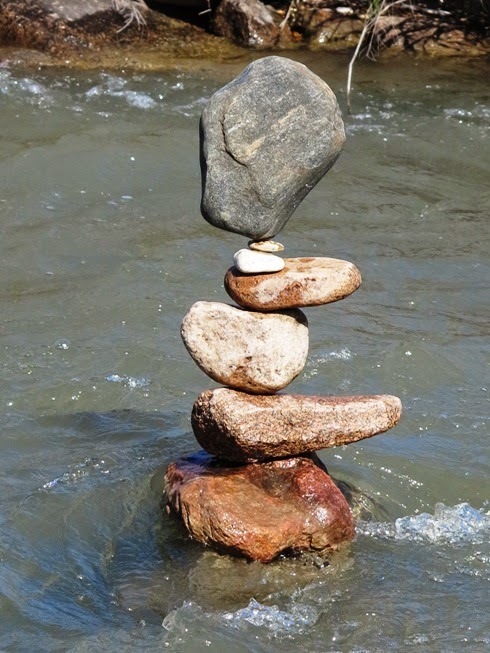 Having watched out guide in Tahiti create an amazing stack of balanced rocks, I was intrigued to see what participants would come up with. TimAnderson, another natural artist, gave several demonstrations during the day as he waded in the flowing Llano River, grabbing rocks from the river bed to stack in unusual formations. Finding the right rock and deciding how it can best be utilized is often a slow process but fascinating to watch. 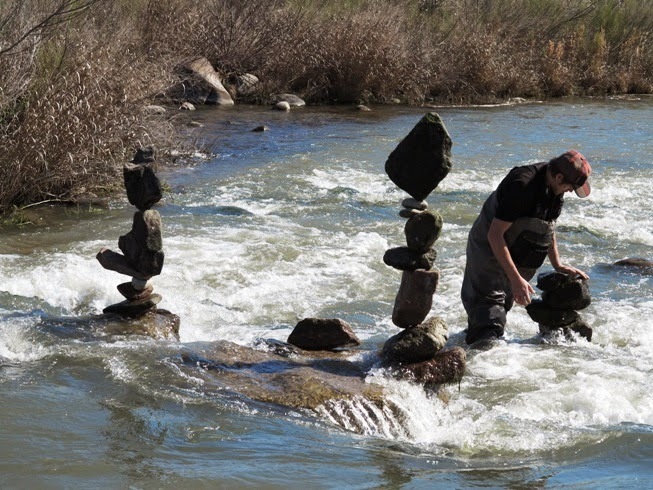 Stone stacking competitions included artistic creations, height, arches, and balancing. Locals got in on the act, too; and for those not into competing, a large pile of rocks had been brought in to encourage visitors to build their own stacks. Rock stacking demonstrations fascinated festival-goers. For spectators like myself, there was live music throughout the day, various vendors and booths displaying eco-friendly products, plenty of food stands, children’s activities, earth art demonstrations, labyrinths, a climbing wall, and additional entertainment. Located about 70 miles from Austin in environmentally sensitive Edwards Plateau, Llano borders on the Texas Hill Country, where you’ll find some of the prettiest landscapes in Texas. As if that’s not enough nature, it also sits on the Llano Uplift, an area filled with lots of granite. So a festival celebrating the natural beauty of the Earth was a perfect fit for this community of 3,300 people. Set beside the beautiful Llano River, the festival, free to the public, enjoyed a perfect spring day. While I marveled at the talent and patience of the artists, most of all, it was amazing to see people become creative with seemingly ordinary objects. Best of all, everyone, including kids, could get in on the fun. Yes, I am a big believer in going to local festivals everywhere and anywhere.